Paul Mitchell, vice president at Political Data and president at Redistricting Partners. Photo: Kevin Fiscus. He’s 45, grew up in Glendale, graduated from American University, lives in midtown, founded Redistricting Partners and serves as vice president of Political Data, Inc. He has been a regular source for reporters on elections, redistricting and voter engagement since the early 2000s and, in January, began collaborating with Capitol Weekly on an explanatory series titled CA120. His pieces provide in-depth analysis on various aspects of elections, including the evolving timeline of campaigns, the electoral power of white partisan voters, the importance of modeling to big campaigns, the challenge of down-ballot propositions, the role of abstention in open primaries, the impact of ballot order on intra-party general elections, the lost opportunity to register young and minority voters, and how to better interpret political polling. I started following Paul on Twitter last year and appreciate his data-driven political observations. We met at Shine Sacramento in February to talk about the city of Sacramento, his relationship with the news and how coffee ties the two together. Paul appreciates the overlapping qualities of the people he interacts with in politics, coffee and cycling. He can run into some of his favorite baristas at the Art Hotel or cross paths with familiar faces along the bike trails. Communities are not mutually exclusive. “This never happens in LA.” Everyone has seen his daughter grow up. You may have seen Seneca on the front page of the newspaper, running in the Sacramento Bastille Day children’s waiters’ race or with dad at the Midtown Farmers Market. For Paul, Sacramento is the grid, a spirit captured by Keep Midtown Janky stickers. He jokes that he can’t tell the difference between Rocklin and Roseville or Carmichael and Citrus Heights. “The parts that feel like Portland – that’s Sacramento,” he says. When he came to Sacramento in 1998, Tapa the World was one of the few restaurants open late. Now, midtown is home to numerous local restaurants, independent coffee shops and vibrant business hubs like the Handle District and the R Street Corridor. 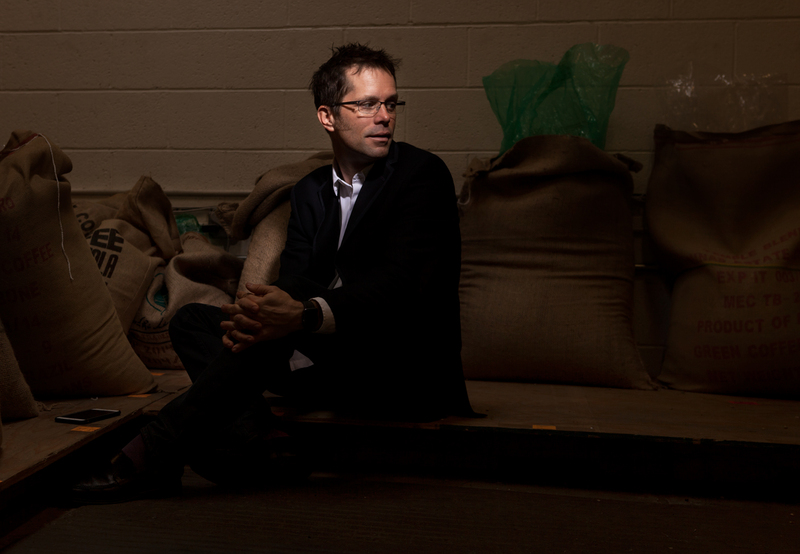 He marvels at the work of local roasters, of how Naked Coffee led to Old Soul and Temple, laying a foundation for Chocolate Fish, Insight and The Mill to follow. You’ll often find him starting his day in one of these shops, eating a bagel and reading the newspaper. It is a time to shut off distractions. He values “the experiential nature” of flipping through the pages and leaving it for the next person. He appreciates the comprehensive narrative of the newspaper form. It is vibrant, niche and he wants it delivered to his doorstep every day. “I want somebody to give me a digest in the paper that will contextualize the last 24 hours of Twitter,” he says. Paul answered the following questions by email about how he gets the news. Text submitted November 10. My day begins early with a hard-copy newspaper, either The Sacramento Bee, or Los Angeles Times when I’m in LA. In Santa Cruz I have to get both the San Jose Mercury News and the San Francisco Chronicle to get enough substance. I am still addicted to the ritual of sorting the sections of the paper, hunting for the articles or columnists I want to read, and absorbing information in that traditional way. Even if I’ve read an article online the night before, I will often re-read it in the hard copy of the paper just in case something changed – like some superstition. But my continual source for news is via Twitter, following certain journalists and publications, and being pulled to online stories. I don’t go to a news website looking for something, I get lured there by social media. And I probably check Twitter 50 times a day. My phone tells me that almost half my battery life each day is taken up on Twitter. The Symbionese Liberation Army shootout in 1974. My dad was a reporter for KFWB, the news radio station in Los Angeles. While media and police were surrounding a downtown location, he got a tip and basically stumbled upon the SLA hideout, just as the SWAT team descended. He huddled behind his car and reported the whole thing live. I don’t remember the shootout itself, but I remember learning about it, and how my dad’s car had been in the middle of a shootout, which I thought was cool. A few years ago he was interviewed about the whole event, and you can hear a bit of the actual broadcast. I also vaguely remember the Fall of Saigon when I was five. I remember the helicopters. Shortly after that we adopted my sister from Korea, and I remember thinking that they were going to get her in a helicopter like the other little girls I had seen on TV. Didn’t exactly know the difference between Korea and Vietnam, apparently. I was much more into news than other kids since I was regularly in a news room, first at KFWB, then at CBS. I remember when we first got cable. I was so excited to watch CNN and, in my early teens, I used to come home from school for lunch to watch Headline News. I pay for the Sacramento Bee and pay for my stepson’s LA Times subscription in LA where he goes to college. This gets me access to the electronic copy of the Times, which is pretty good. I refuse to pay for other news sites and really hate the whole “firewall” system the media is using to try and create ongoing funding – it seems to me that is a bad long-term market strategy. Sure, you could get money from some people who really appreciate the content they know and trust, but you are limiting many others from your content, and therefore limiting the number of people who, in the future, would come to know and trust your reporting. So, a little short-term gain for a long-term destroying of your brand with newer readers/viewers. A dinner at The Kitchen for my wife’s parent’s 50th wedding anniversary. John Myers. He has done TV and radio and is now going to print. The content of his reporting is spot-on, intelligent, and asks the right questions. But he is also great at communicating with new media – Twitter, podcasting, etc. And he is able to pull this off in a genuine way that is true to who he is as a reporter, it doesn’t seem forced or something his editor is making him do. (1) Homelessness — Sacramento has a massive homelessness problem that we see on a daily basis living in midtown. And we seem to either not have the tools or the willingness to fix it. (2) Transportation — Traffic in and out of the city is horrible, and downtown is worse. I would love to see more people riding their bikes to alleviate this congestion, but our city has not done enough to make cycling on the street safe, pushing people on to sidewalks and dangerous confrontations with pedestrians. It is a mess. I would love to see dedicated bike ways downtown and out to midtown, East Sacramento, Curtis Park, Land Park and Natomas, and then some better infrastructure for mass transit, like the light rail and a trolly system in the most high-impact downtown/midtown/West Sacramento area. (3) Governance — For many years our city government has been too confrontational, and not working together with a shared vision. Look at the leadership on the other side of the river – West Sacramento has had a council and mayor that work together, and it has resulted in a rebuilding of their community, investments in jobs, education, transportation. In Sacramento, too many people take pride in the things they stop, rather than the things they build. I do think we have gotten away from the concept of the news as a public good, and it is now more of a consumer good. Decades ago, news came from a handful of primary sources, and everyone received roughly the same content. The proliferation of media outlets has allowed for a greater range of secondary news sources, allowing people to find news from a range of different opinions. But it has also changed the way the news is viewed – we watch news that reinforces our current beliefs, rather than all watching the same news and building our beliefs from that same core of information. What could be seen as a wonderful opportunity for additional voices and decentralization of information in our media has had the unintended consequence of polarizing political and social views. I don’t take a dystopian view of the news media, but I think we should be cognizant of how it is changing, and we should try to rebuild the concept of news as a public good important to the creation of an informed conversation about the world we live in. I think most news I care about is being reported, somewhere. No matter what little niche issues I care about, there are going to be websites or specific news outlets that will be covering it. Do my top issues show up in the hard copy of my newspaper? Not always, but I’ve grown to not expect it. Riding my bike in Marin. I’ve always said that Sacramento is great, in your rear view mirror. Meaning that one of the best attractions of the area is how close it is to other places you would actually love to be – like Napa, Tahoe, or the Gold Country. As a cyclist, I ride all around Sacramento, and get outside of the city itself as much as I can. Follow Paul (@paulmitche11) on Twitter and connect with him on LinkedIn.